We install your purchased SJ Template/SW Theme and setup your Joomla /WordPress system as our live demo with sample data within 24 hours. After you purchase this package, please send FTP account, database account to Installation Department in our Ticket System. In the case your Joomla/WordPress site is exist and you want to change theme and extensions like our demo site, please submit a ticket to CUSTOM WORK department, our support will review your site and send quotation within 24 hours. 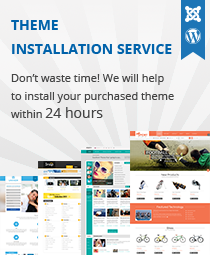 Note: We just only provide this service AFTER you get full package of code for theme you want. And this is applied for installing on one domain (or one sub domain). If you want to install to many domains (or sub domains), please make other orders for this. To get full package of code, please join our clubs at the first.